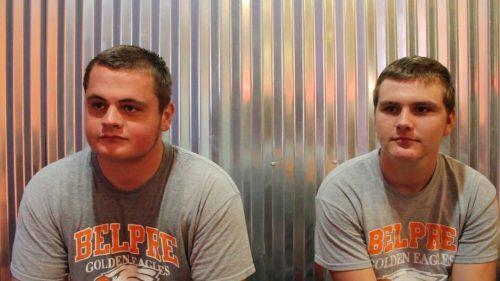 Belpre, Ohio, High School football team leaders Logan Racy (left) and Aric Ross (right). A teammate died from a heroin overdose two years ago. Taking on the role means being good role models on and off the field, according to Ross. And that includes remaining opioid free. Racy agreed, and said the love of the game is a good deterrent. The two are not alone. A recent study from the Journal of the American Academy of Pediatrics found students who participate in extracurricular activities were less likely than their peers to have long-term opioid use disorders. Two years ago, a teammate died of a heroin overdose the summer before his senior year. The death was hard for the students and the educators working in the Belpre City Schools system. 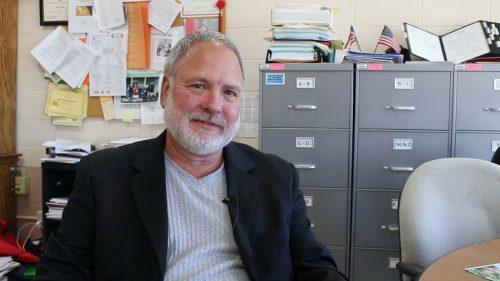 Belpre City Schools superintendent Tony Dunn hopes drug testing can help avoid another tragedy. A committee of adults joined student athletes like Logan Racy in response to the tragedy and established a random drug testing policy. Middle- and high-schoolers involved in extracurricular activities or who drive to school are tested. Students who violate the program are given up to three strikes. Upon each infraction, the student is brought in for counseling and faces increasing punishments from suspension from extracurricular activities up to a ban on participation. The program may not keep every child from abusing opioids, but Dunn said the schools needed a way to reach the kids suffering from addiction. And by providing treatment and counseling for those students rather than expelling them, they hope to prevent the next tragedy. “The ultimate success will be none of our kids will die from accidental overdose,” he said. Another drug prevention program in West Virginia also uses drug testing kits but hands the responsibility of administering them to the parents. The office of the U.S. Attorney for the Northern District of West Virginia set up a booth at a recent match-up between the reigning AAA division champions in Wheeling Park and the reigning AA division champions Bridgeport as part of the “Give Me A Reason” program. 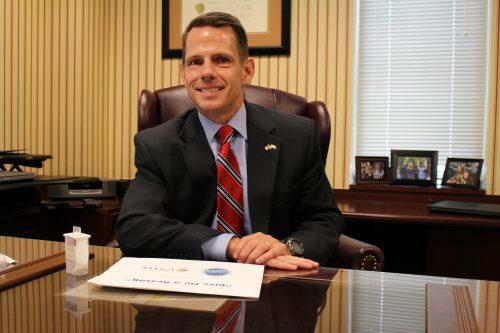 U.S. Attorney Bill Ihlenfeld helped pass out the saliva-based kits –which are funded through the federal Appalachian High Intensity Drug Trafficking Area program– to parents as a means to give kids a reason to reject drugs. “They can honestly look their peer in the eye, their teammate, their quote-unquote friend and tell them ‘I can’t use that because my parents drug test me,’” he said. U.S. Attorney for the Northern District of West Virginia Bill Ihlenfeld encourages parents to test kids at home. Since the program’s inception in 2014 for the four Appalachia HIDTA states (Kentucky, Tennessee, Virginia and West Virginia) West Virginia has handed out approximately 2,500 of the total 7,000 kits distributed. But as those tests appear in more homes and schools, there are big questions about what effect they have. Dr. Steven Matson, Chief of Adolescent Medicine at Nationwide Children’s Hospital in Columbus, Ohio, is among those who oppose the use of drug testing outside of medical settings. Many pediatricians agree and the American Academy of Pediatrics repeatedly calls for drug testing only in medical situations. The Society points to studies on school testing programs which have shown mixed results. Matson also runs an addiction clinic at Nationwide Children’s Hospital, working with clients aged 14 into the late teens. Drawing on his experience with teenagers, he said he believes that parenting a child is a better way to keep them drug-free than drug testing them. Researchers for the Journal of Psychiatric Studies last year found children who receive direct involvement from their parents are less likely to abuse opioids. Set the expectation of a drug-free lifestyle for the child and clearly state that. Have conversations about drug abuse based in love, rather than fear. Get to know the child’s friends. Make a point to spend time together as a family. Offer the child unconditional love. Matson said the medical community also plays a role in limiting access to the opioids children might abuse, especially prescription painkillers. His colleague Sharon Wrona, Administrative Director of Pain Management at the hospital, works to develop best practices when it comes to treating young patients with opioids. 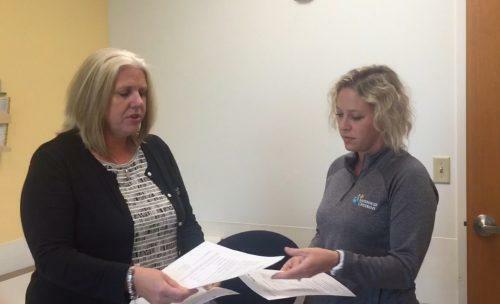 Sharon Wrona (left) is Administrative Director of Pain Management at National Children’s Hospital in Columbus. Environment, previous medical history, and family history with opioids are just some of the factors physicians are paying closer attention to. To keep opioid prescriptions at a minimum, physicians are first recommending treatments such as aromatherapy, physical therapy, and acupuncture. Teaching children and their parents to manage pain at home is also a priority for Wrona’s team. She said one of the more effective lessons comes through gamification. Statistics show these efforts might be paying off. In Ohio, the number of solid opioid doses distributed by doctors in 2015 fell by 81 million between compared to 2011, according to new data released by the state’s Department of Health. 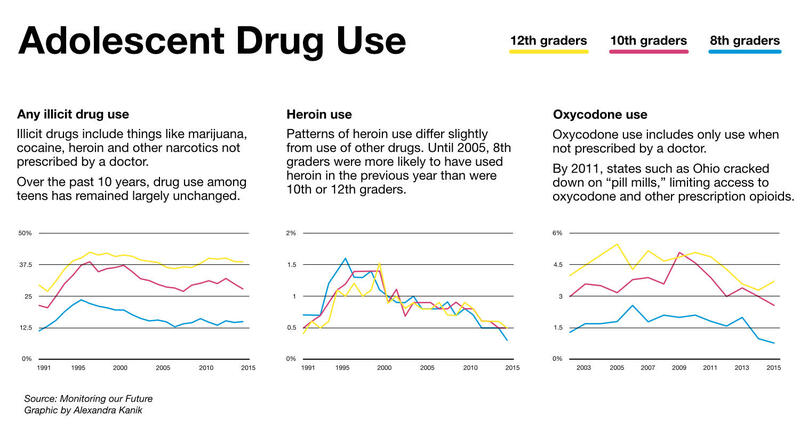 Elsewhere, data from the group Monitoring the Future indicates that opioid abuse hasdropped over the past few years among 8th, 10th, and 12th graders. Most experts believe if enough resources go toward proven prevention and treatment programs, healthy children will grow into adults with a better shot at ending the epidemic.